Mamelodi Sundowns coach Pitso Mosimane believes that Steve Komphela has proven himself to be a good coach, despite his unsuccessful spell at Kaizer Chiefs. The Brazilians will renew their rivalry with Bloemfontein Celtic after the two side’s were drawn against each other in the first round of the upcoming Telkom Knockout Cup at the Lucas Moripe Stadium. When the two side’s met at the Dr Molemela Stadium last week Wednesday they were forced to settle for a point each after playing out to a goalless draw. 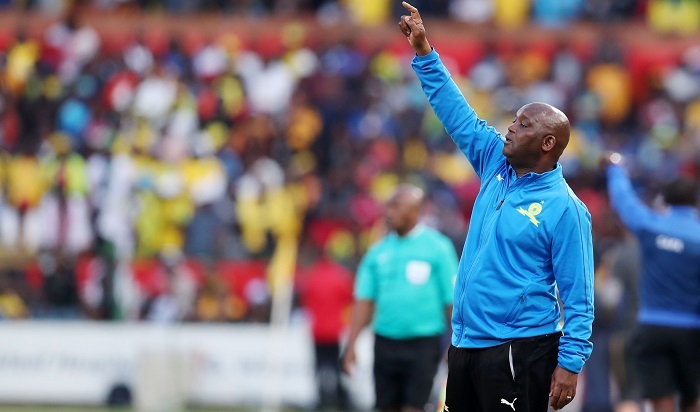 Mosimane expect a difficult game against an in-form Celtic side, who he believes are revived and benefitted from not participated in any cup competitions so far this season while Sundowns continue to deal with their congested fixture list. ‘It’s obviously going to be a difficult game,’ Mosimane told his club’s official website. ‘Cup games are always a little bit of a problem for us. If you look at the top eight, it clashed with the Caf Champions League. You saw that we had different lineups when we played in Cape Town and home in the semi-final of the MTN8, that had an effect on the result. ‘The Telkom Knockout clashes with the Champions League that’s about to start in a few weeks’ time. That also has an effect on us. We are two games behind in the league in terms of our schedule and there are also international games. To play against a team that nearly won this competition last year, a revived team, will be difficult. Mamelodi Sundowns will take on Bloemfontein Celtic in the Telkom Knockout Cup at the Lucas Moripe Stadium on the weekend of 19-21 October with the kick off time yet to be confirmed.